^what exactly is that skill? only talent affecting feast in inferno tree is gluttony iirc so i'm guessing it's that? To answer your question though, the cost of adding/removing runes is relatively small, especially lower level ones. So its a matter of personal preference whether you think its worth it or not. I know for a fact that on Storm, there is an Inferno Bat rune and a Mana Explosion rune. I'll see if I can get a screenshot of the runes since I do not personally own those runes. Both are 5 star runes and were on lvl5 runes. 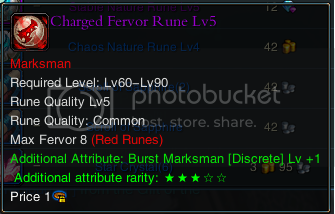 I noticed your advanced rune spreadsheet doesn't list charged level 3 runes (9 energy). Also I don't think its possible for Advanced lv2 runes to be anything to be stable, at least I've never seen a chaos one. Advanced Chord of Raindrops has been confirmed on Storm to be on a normal lv5 rune so that can be updated. In addition, I recently made a Sonata of Water rune. 4 star rating on what I believe to be a lv5 exclusive talent. Dark tree for vamps also has a confirmed Hemophilia rune, though I'm not sure whether it's Advanced only or not. Considering I don't think we've seen one on Storm yet, so I'm not sure of the details of the rune itself. Triple Partita rune exists for bard, Lv5 Exclusive and 4 Stars I believe. The Wind bard list is also missing Wind Maneuver which is another Lv5 Exclusive rune and 4 Stars confirmed. any chance demon runes will be added to this? or the rune spreadsheet?